The College of Medicine curriculum integrates the basic and clinical sciences—with basic science courses teaching the clinical implications of the material—and provides clinical experience starting in the first semester. The curriculum also addresses the humanistic aspects of medicine, including its ethical, legal and social implications. Throughout their four years at Upstate, students acquire the knowledge, skills and attitudes necessary to become competent, caring physicians. All College of Medicine students spend their first two years on the Upstate campus in Syracuse. At the start of the third year, one-quarter of the class moves to the Binghamton Clinical Campus. The rest of the class remains in Syracuse, and completes clinical education at SUNY Upstate Medical University and its clinical affiliates. Students learn the same skills at both campuses, but the ambiance is different. Much of the clinical training in Syracuse takes place in a tertiary care setting, the special focus of a university hospital. 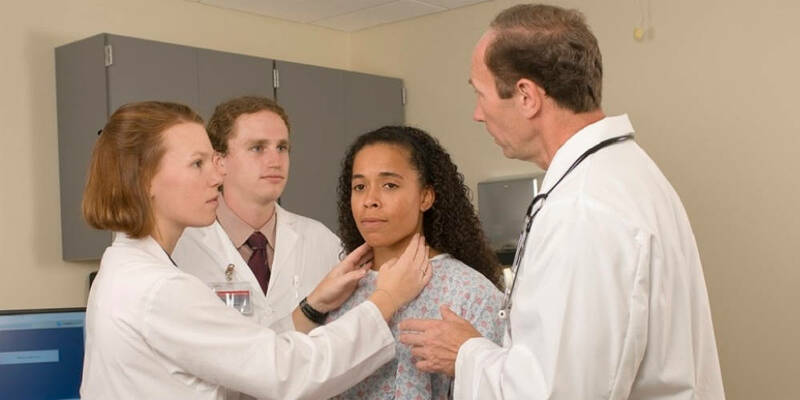 In Binghamton, most of the training occurs in a community-based setting that is more akin to the environment in which most physicians will practice later on. Applicants indicate their campus preference within two weeks of the admissions interview, and are assigned to a clinical campus upon acceptance to the College of Medicine. Last Modified: July 24, 2018. Contact Barb Hinds with questions about the content of this page.